There are many factors to consider as you design, develop and test a pneumatic conveying system to move your dry bulk goods. On site, a system failure can be expensive and even disastrous. But in a controlled environment, failures can actually give you an advantage. That's why a full-scale testing facility is the intelligent choice for guidance on pneumatic conveying systems. 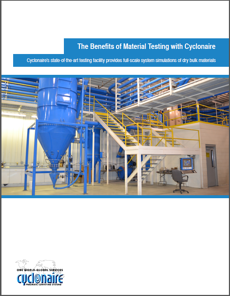 Our new eBook, "The Benefits of Material Testing with Cyclonaire," explains why testing facilities can save you from errors in real situations—and save you investment in time and money. The guide walks through numerous factors explored by testing facilities like Cyclonaire's state-of-the-art CycloTech, which can test materials for characteristics like flowability, conveyability and degradation. Complete the following form to obtain your free copy of The Benefits of Material Testing with Cyclonaire.